While the world’s media counts the toll of those who died in the Savar tragedy (at time of writing it reached 940), the notion of freedom of speech has been severely under attack by Bangladesh’s Awami League led Government and others.Â Â Last month in April,Â Hefajat-e Islam, an Islamist protest organisation whichÂ campaigns against equal rights for women and against secular education,Â attempted to shut down the capital Dhaka due to “atheist bloggers” insulting Islam. Hefajat were demanding that the government institutes a new blasphemy law which would make anyone who insults Islam face the death penalty. Some Islamists decided not to wait for legal changes and at least four atheist bloggers have been targeted to be killed. One of them isÂ Asif Mohiuddin who called himself “Militant Atheist Blogger”, in JanuaryÂ he was brutally stabbedÂ after the police asked him to stop writing onÂ his blog. 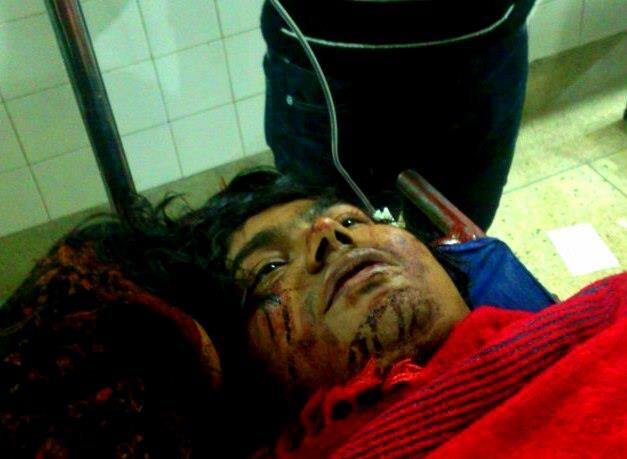 This was the latest in a series of attempted and successful murders of atheist and secular proponents in Bangladesh. 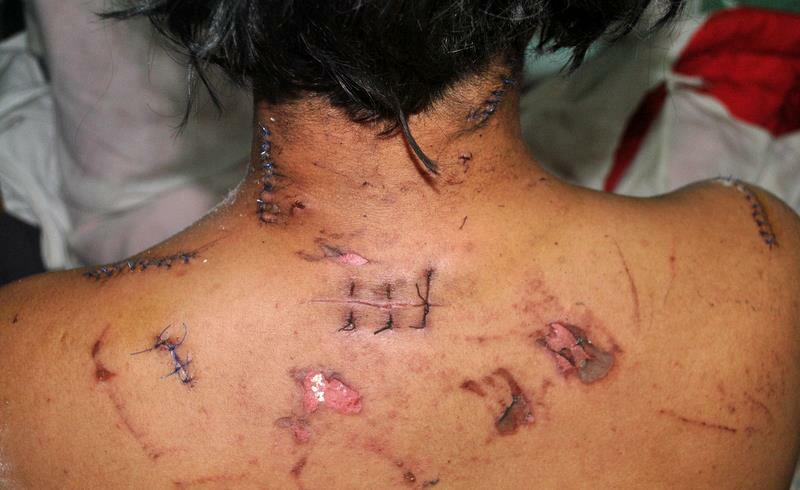 MohiuddinÂ recovered from his horrific injuries pictured below, and continued to blog his views which led him to be subsequently jailed. On 2nd and 3rd of April, the police arrestedAsif Mohiuddin and three other bloggers, Subrata Adhikari Shuvo, Mashiur Rahman Biplob and Rasel Parvez using a law regarding â€œhurting religious sentimentsâ€Â written in 1860. They had all written blog posts criticising the ruling Government’s attempts to appease Hefajat-e Islam. Just over a week laterÂ on the 11th April, the police arrestedÂ Mahmdur Rahman, a newspaper editor of an opposition paper for his part in an international controversy which revealed a Skype chat between the government and officials in the “International Crime Tribunal”. The backdrop to all of this, is that Hefajat-e Islam isÂ suspected by some Bangladeshi civil right organisations to beÂ in close alliance with or a front for Jamaat-e-Islami,Â a prominent right-wing Islamist opposition party in Bangladesh. Three of their leading politicians were arrested in 2008 over alleged war crimes that took place duringÂ the 1971 liberation war. The arrests and theÂ International Criminal Tribunal prosecution has been criticised by groups like Human Rights Watch and other international observers as being politically motivated, its proceedings as beingÂ heavily influenced by the current government and violating fair trial standards. On February 28th of this year,Â Delwar Hossain Sayedee, the vice president of Jamaat-e-Islami,was sentenced to death for his alleged part in war crimes. In response hisÂ party called for a two day strike on 3rd March. This led to clashes which involved indiscriminate shooting of civilians by the police and resulted in 80 deaths with over 2000 people injured in what the BBC reported as “The worst day of political violence in Bangladesh in decades”. Â This week,Â Mohammad Kamaruzzaman, assistant secretary-general for Jamaat-e-Islami has also been sentenced to death for war crimes, he would have been 19 when he committed the alleged war crimes. The Government led by the Awami League have put police on high alert as more clashes and protests are expected. In this power struggle between twoÂ reprehensible andÂ corrupt political factions, the Socialist Workers’ Party have decided to against the secularists and side with Jamaat-e-Islami and their supporters in Britain who have formed theÂ Feb28 for Justice campaign group. The group protests against the Awami League because they claim it to be “fundamental secular regime” who want to “De-Islamise” Bangladesh and make it “a purely secular country”. The name “Feb28 for Justice” was a clear allusion to Delwar Hossain Sayedee’s death sentence but that detail perhaps escaped Charlie Kimber, the Socialist Workers’ Party (SWP) National Secretary, who spoke at their rally with an approving report on their website. What has the British SWP got in common with Bangladeshi Islamist Far-Right? The SWP’s biggest electoral success was in 2005, when they made a Faustian pact with George Galloway to form the Respect Coalition. Galloway ousted Oona King and became Respect’s first MP, he had the support not only of the SWP but according to Delwar Hussain on Open Democracy, Galloway also had the support with the close East London Mosque affiliate, the Islamic Forum of Europe. Islamic Forum Europe (IFE), an organisation associated with the mosque, urged voters to vote for Galloway; although it said he was “unlikely to establishÂ khalifahÂ in East London”, and he has “passionately (campaigned) for Muslim political prisoners far more than some of our Muslim community elders who are still living in the days of the subservientÂ maharajasÂ in British India. The East London Mosque held a reception for Galloway soon after he was elected, and a year later they also invited Sayedee who was then a current Bangladeshi MP to speak as an honoured guest, whichÂ sparkedÂ great controversy and comment in the right-wing press and national media. Â In 2008, Azad Ali, a leading light of the Islamic Forum Europe, campaigned with many others in the “Muslim community” supporting Ken Livingstone’s failed attempt to gain a third term as London’s Mayor. Undimmed in 2012, Azad Ali once again showed his support for Ken. IronicallyÂ Azad Ali has arguedÂ againstÂ democracyÂ â€œif it means at the expense of not implementing the shariaâ€. This idea is consistent with the ideology of Jamaat-e Islam and Hefajat, the latter he has recently shown sympathy with. Andrew Gillian suggested that IFE’s support for Livingstone was in gratitude for a Â£500,000 grant that Livingstone ensured was awarded to extend East London Mosque in 2004, despite the decision being strongly contested by London Development Agency’sÂ senior managers. Ken Livingstone’s accommodation of Islamist ideology was made plain in 2012, when he was filmed making a pitiful plea saying that he would “make London a beacon for Islam”. The Islamic Forum Europe are electoral and social power brokers in Tower Hamlets, it is no surprise that both the SWP and Ken’s acolytes in Socialist Action have tried to keep them sweet. The SWP’s record their commitment to any notion of democracy leaves little to be desired. To explain, it will help to reveal some autobiographical history. Some regular readers, may remember that I attempted to stand for the position of Assistant Secretary in the only election Unite Against Fascism has ever held back in 2012. Unite Against Fascism (UAF) is considered one of the UK’s biggest anti-fascist movements, it enjoys over tens of thousands of pounds each year from major unions like National Union of Teachers, PCS and Communication Workers’ Union. The campaign is widely known to be run by the Socialist Workers’ Party, and the history of UAF involves a checkered past. I,Â perhaps naively,Â wanted to use the election and if elected the position to re-orient the politics of UAF towards genuine community organising. In the end,Â I wasn’t allowed to stand due to a mistake made by my union branch and the reluctance by the officers to allow my branch to rectify it before the deadline or the conference. So instead of a contest, Martin Smith was elected unopposed as the Assistant Secretary of UAF. Martin Smith has since vacated the position and was conspicuously absent from this year’sÂ UAF conference. His position has apparently been replaced by two people: Jude Woodward, a former “culture adviser” to Ken Livingstone and a person called Brian Richardson. Undoubtedly people of such outstanding anti-fascist credentials that UAF’s membership did not need to be troubled this year with the formalities ofÂ an election. Retrospectively it was a lucky escape not to be elected into a political organisation that can welcome Khalifah-wishers like Azad Ali as one of its officers. So UAF and the Socialist Workers’ Party that runs the campaign with Socialist Action, clearly has shown contempt for democratic structures within its own organisation. More broadly it has accommodated contempt for democracy in general as it has accepted Martin Smith’s argument which warps no platform for the BNP into “No Freedom of Speech for Fascists”. SoÂ basically ditching the principle of Freedom of Speech as it also means freedom of speech for Fascists. Strangely the SWP and UAF by extension have ended up mirroring the very thing they claim to despise. I thought your argument was good, but I did feel the photos were a bit too graphic… I know you gave a trigger warning, but… I think your argument stands alone, without the photos.